We initially sat down to write a blog post telling the story behind our newest offering from Antonio Medina, and the unique way it was sourced. Then the global coffee price plummeted to 96 cents per pound, well below what it costs to produce coffee. Reading the discussions that ensued online, it highlighted the misconceptions regarding how coffee is priced and paid for. For example, many take comforts in the Fairtrade label, unaware that it does not always ensure a living wage for farmers. We can all agree that our enjoyment of coffee should not come at the expense of the farmer’s livelihood, but we may not realize that it often does. While addressing these heavy issues, Antonio Medina’s story felt especially relevant. We hope sharing his experiences will shed light on the inherent injustices and shortcomings of the coffee trade. So, buckle up, because we’re headed to Guatemala to examine the true cost of coffee. Antonio Medina’s farm, Finca La Colina, is located near the small municipality of San Martin Jilotepeque in southern Guatemala. He is a fourth generation coffee grower, and until recently he only sold coffee cherries to be processed elsewhere. Four years ago, he started processing his own coffee and selling it at higher prices. Thanks to selling specialty coffee, he put all five of his daughters through university, an opportunity he never had himself. He has also invested in improving the ecological sustainability of his plantation. Just one quarter of his property is planted with coffee, the rest is native forest certified by the National Institution of Protection of Forests. He uses the highest quality fertilizers, so he can apply as little as possible, and produces his own organic fertilizer from coffee pulp in addition. The upper portion of his property has been given to the indigenous communities who work on his farm. Shade trees Antonio has planted protect the land from erosion and offer a habitat for local birds. The man himself; Antonio Medina. Photo via Shared Source. The C-price fluctuations over August 2018. There are so many passionate coffee growers like Antonio, but not all have the same ability to reinvest in their farms and families. As the specialty coffee industry explodes around the world, coffee farmers are barely covering their costs of production. This imbalance is caused by how coffee is priced and paid for at the farm level. Most green coffee (yes, even specialty coffee) is priced according to the global commodity coffee price, referred to commonly as the C-price. The C-price is set by trading on the New York Commodities Exchange and fluctuates according to several global factors. Very little specialty coffee is bought at the exact market price, but the C-price still has a heavy influence. For most specialty coffee, the C-price is the base price (the cake) and then a premium (the icing) will be added for higher quality. However, the farmer is not paid when the premium is set. Typically, the pricing terms (C-price plus a premium) will be agreed upon, and then the price will be locked in on a later date. 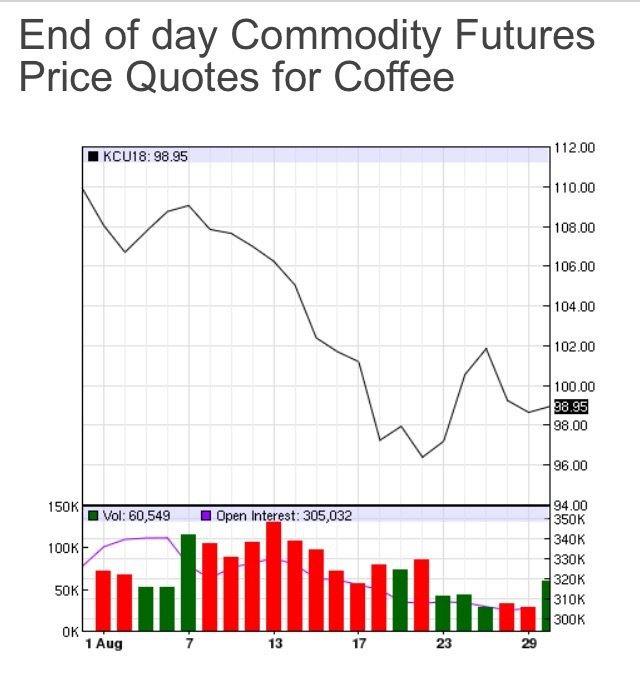 If the C-price drops significantly (as it did in August 2018) the farmer could end up in a loss position once they are paid for the coffee, although it appeared they would profit when the premium was negotiated. If the global price only affects how much we pay for green coffee, but not how much we pay for a cup, producers are the only ones negatively impacted by this price volatility. And when consumers resist paying more for their caffeine fix when the prices are higher (and fairer), it perpetuates this vicious cycle. Antonio Medina, on the other hand, negotiated prices differently. The importers we worked with meet with Antonio (and all producers they partner with) and ask what he requires to pay himself a living wage. That is the minimum price they will pay. If Antonio commits to adopting more ecological farming practices, the importers will pay more to compensate for the risk of decreased production. The C-price is not involved. It seems logical to price coffee according to what it costs to produce it, but in the current landscape it feels revolutionary. Antonio is empowered by this financial stability to continuously improve his growing practices. None of that would be possible if he were paid the market price for coffee. While farmers' livelihoods undergo monumental shifts when they are paid what they deserve, it makes a difference of only around 50 cents more on a cup of coffee for us consumers. At Rooftop, our coffee buying ethics are centered on equitable sourcing. We see it as our responsibility to contribute to systems that will empower producers and ensure them appropriate compensation for their work. Though we aren’t big enough to buy directly from producers yet, we seek importing partners who are transparent about how they pay for coffee, and who prioritize financial security for farmers. Our buying practices are not perfect, but we are moving in a new direction with higher expectations. Always asking questions, always improving. Now what can you, the coffee drinker, do to ensure your dollar is going to the right place? Look for roasters who prioritize responsible sourcing, and who put actions behind those promises. When coffee drinkers wanted to know more about where their coffee was produced, the coffee industry met that standard with “traceable” coffee. Some specialty cafes today could tell you the farm that produced the coffee for your latte, but this was not the case 30 years ago. It’s not enough anymore just to have the farmers name on the bag. Expect more. The specialty coffee industry needs to be held accountable for the lofty ideals of equity it espouses. Also, be ready to pay a bit more for coffee. Coffee has a cost, and if the consumers are not paying it, it’s the producer’s livelihood that fills the gap. We often compare specialty coffee to wine. The price for a glass of red wine can vary wildly, yet we expect to pay roughly the same for a latte regardless of the coffee that was used to make it. Don’t be surprised if the coffee menu at your favourite shop accurately reflects the varying costs to produce coffee from the different origins that are offered. And remember, $9 more on a 340g bag of coffee means just 50 cents more for a cup, but it could be a world of difference for the producer. All of this is just a start; we have so much more to do. But if you readers take anything from this, we would hope you become more conscious when you’re buying your daily cup. Coffee is a luxury; let’s make sure we’re paying what it’s worth.